What’s the Best Spotting Scope for Target Shooting? Do you shoot pistol or rifle? Long or short range? 100, 200, 300 or 500 yards? 1000 maybe? Long range to a pistol shooter can be short range to a rifle shooter. But even so, at long pistol ranges it can be difficult to really make out the detail of small caliber holes on a scoring target unless you’re using some sort of optic. At the shortest ranges binoculars and rifle scopes themselves can do the job, but to see the fine detail, and see it clearly you need a spotting scope. Environmental conditions matter more at longer distances. Dust, heat, humidity, these all affect light. Only the best quality of optic can resolve a quality image with fine detail as you approach 500 yards. The longer your range the more quality of that scope begins to matter. In general the further you want to see the more you need to spend. Do I Need An Angled or Straight Body? This part of the article will discuss spotting scope specifications. Just in case you missed it or need a reminder, we’ve written a guide on what spotting scope numbers mean. Check that out if you’re unsure of anything. Seeing target holes from .22 or air-rifle rounds on a target face at anywhere up-to 100 yards is going to sit well with pretty much any spotting scope in the 15-40x range with an objective lens from 50mm upwards. You’re going to be safe enough with a budget optic. There are lots of well priced and well featured budget spotters on the market, and we’ve also covered even more of them in our upto 100 yard range in it’s own article. If you’re only shooting short distances, one specification you may want to take into consideration is the close or minimum focus distance. Scopes won’t focus on close-up objects, so if you sometimes want to spot something at 20 yards, make sure your scope will give you the minimum focus to do that otherwise all you’ll see is a blur. When you get over 100 yards and move into longer ranges like 200 m this is where optical quality begins to come into play. Bargain basement budget scopes generally have lower quality lens glass, lesser coatings and generally a poorer internal construction than those with a slightly higher price tag. We’d suggest looking for something with anywhere from a 15-60x magnification with a 60mm to 80mm objective lens and importantly a mid range price tag. You can leave the 100mm behemoths for longer ranges. Budget scopes will start to struggle to focus and give poor quality visuals at anywhere from 100-200 yards and when you’re target shooting small caliber, the finer details are exactly what you are looking for. Moving on from 200 up to 300 yards is where you’ll need slightly higher magnification specifications as well as an even more quality optic. You’ll want to make sure you get some decent upgraded glass in your scope, HD (High-Definition), FL (Flouride) or ED (Extra-low Dispersion) are all higher grades of glass. Standard glass offers standard quality images in ideal situations but as available light levels drop, as they do when you zoom, or in low light conditions, these upgraded types of glass offer better image resolution and vivid images with better color. This is the type of distance that even with a good optic you may have to consider using splatter targets that give you more to look for. Shooting up to 500 yards and seeing clearly is something left to the highest levels and quality of optics on the market. You’ll have to be prepared to pay for this sort of quality. Depending on conditions you’re going to struggle to see target holes at 500 yards with anything but the best quality optic. If you’re not scoring then destructible and splatter targets are going to help a lot. Chromatic aberration, heat, wind, dust and other factors come into play at these ranges and often over 500 yards scopes aren’t used for anything more than reading wind or checking results from another mid-way spotter located closer to the target. Depending on the conditions, the type of target and the quality of your optic your mileage may vary at these sort of distances. We’d recommend the highest quality and magnification your budget can stretch to. As a general rule higher quality optics will give you better eye relief. Eye relief is the measure of how far your eye can bee from the eyepiece before you begin to reduce the size of the image available to you. Competitive target shooters often wear spectacles and also shooting glasses over those specs. If you do this you already have glass at a certain distance from the surface of the eye. You need to measure or estimate just how far that glass sticks out from your eyeball and ensure that your chose scope has enough eye relief to allow you to see the entire image without having to remove your existing eyewear! Angled scopes with rotating eyepieces are great for target shooting setups where you can simply align the eyepiece to allow you to use it with with a small turn of the head from your firearm scope, rather than having to leave your shooting position. Some people find straight scopes are more natural and easier to find a target quickly as you’re looking in the same direction, and they’re better for looking downwards. They also naturally shelter the eyepiece from external conditions like rain and snow better than an angled scope. An angled body is the more sensible choice for a target shooter. That depends on how and what you want to do with your scope. We’ve written a full article on the pros and cons of the two types but in brief. You may just about be able to get away without a tripod at 100 yards, but the further you shoot the shakier the image will become unless you mount your scope on a stable base. Ideally you need a tripod at all distances, some scopes include a tripod and nearly all of them are tapped with a tripod standard ¼”-20 thread hole that allows you to attach them to a tripod. We’ve covered the best tripods out there in depth in their own article. Good quality scopes are usually purged with nitrogen gas (sometimes argon) and sealed. This sealing makes them waterproof, which is great if you’re unsure the conditions you’ll be shooting in day after day. Too much light entering an optic can also blast your image and your eyes so bright sun can be counteracted with sun-shades that retract and extend from the objective lens. This is a useful feature for the outdoors shooter. Some sort of rubberized armor is standard on most good scopes. Whilst this doesn’t make them rugged, it certainly helps protect from scratches and small knocks that they will no doubt receive throughout their life. A soft case will protect your scope during travel, but a hard case will offer the best in protection from all eventualities at the expense of a little more packing space and cost. With a decent zoom range (20-60x) and a 80mm lens size this budget 45 degree angled scope has the specifications of a scope for more than just 100 yards. It has all the features you’d expect from a decent scope like multi-coated lenses, rubber armor, nitrogen filling, waterproofing and a sun-shield. You can rotate the eyepiece so that this scope is usable pointing skyward or angled away from you for a shooting bench or prone setup. GoSky also throw in a host of accessories. These include a mini tripod, a basic snug fitting soft carrying case, cleaning cloth and lens covers. If you want to take pictures of your shooting prowess from long range then there’s also a digiscoping adapter included, albeit one that’s a little fiddly and not particularly easy to use. Overall though, for a budget piece of kit this scope gives good short range (100 yard) results. Celestron make a lot of optical equipment from telescopes to microscopes and are a big name in optics. The Ultima is a good quality optic that comes in a variety of different objective lens sizes. We’d pick the 20-60x 80mm 45° angled scope for shooting out to 200 yards. It’s not the smallest and most compact, but the smaller scope can struggle at the longer range as this isn’t the highest quality optic on the list and doesn’t cost the earth. The eye relief is okay at 18mm. 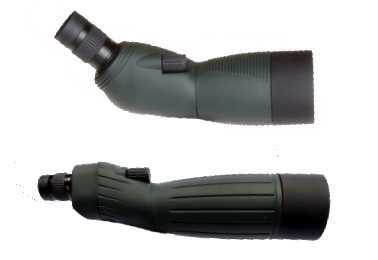 It’s fogproof, waterproof, has multi-coated optics, and great 6m close focus for short range applications. There’s no freebies like a tripod with this, but that gives you the opportunity to find a good aftermarket. Sometimes the quality of giveaway tripods are no match for a good aftermarket one. With a slightly higher price tag comes a better quality of scope from Redfield. This 20-60x zoom Rampage scope with an 80mm objective lens sites in the low to mid range of quality where scopes are concerned. The housing has the expected rubberized armor to give it durability and crucially for shooting setups the eyepiece rotates around the body so that you can use it prone or angled to the side with just a turn of the head. Redfield include a tripod and the scope has a retractable sun-shade for the objective lens. Here’s a video unboxing the 60mm straight variant of this scope. Not the one we’d choose for 200m target shooting but this gives you a great view of the scope, accessories and features. The eye relief at 19.3-16.6 mm isn’t the best, but it isn’t bad either just beware if you have shooting glasses or spectacles this might not be the scope for you. If you like your products made in the USA you’ll like this one. Leupold are a name synonymous with quality in the world of optics. The Ventana is a well priced mid-range scope that will work well for up to 300 yards. Whilst this scope has a 15-45x60mm variant, the one we’re looking at is the 20-60x80mm angled scope. This model gives you much better eye relief than some of the others at the same price point. Anywhere from 26-24 mm depending on the magnification level. That’s more an adequate for your average spectacle or shooting glasses wearer. One thing to note however is that this model doesn’t have a rotating eyepiece. Just be aware that some shooters need this for their setup, whilst scorers, spotters and other enthusiasts don’t. Here in the mid range of scopes we see what a little more money can buy you. The Vortex Razor is available with 3 sizes of objective lens 50mm, 65mm and 85mm and both straight and angled body variants. If you want to spot out to 300 yards you’ll be looking at the largest of the 3, the 85mm variant. Razor scopes are purged with Argon and not Nitrogen. The purging process as you know removes any oxygen from inside the scope and prevents moisture and fogging. The real benefits of Argon over Nitrogen? Unless it’s diverse temperature operating ranges, we aren’t sure here what this actually gives you. Vortex proprietary anti-reflective coatings cover the lenses on all sides inside and out several times. These help to maximise light transmission. When you’re spotting at longer distances you’ll begin to see things like chromatic aberrations which are fringes and edges to objects that shouldn’t be there. The Vortex has an apochromatic lens with 3 segments that help to correct these issues. Spotting out to longer ranges you need high quality glass and the Razor has HD (high density) glass which gives a clearer sharper more vivid image than standard glass. Better for spotting target holes at distance. This is a great scope that outdoes some of its more expensive rivals. Swarovski make glass, not just pretty crystal statues that look nice on the shelf. They make some of the best glass too and as one of the best and most respected manufacturers their products demand a high price. This particular scope is the 80mm objective lens variant. Buyer beware, this is a scope with interchangeable eyepieces and can be sold as the ‘body only’. That means you buy either the ATS angled scope body or the STS straight body and then an eyepiece to fit onto it, either a 25-50x wide or a 20-60x. There’s HD glass inside this which also contains fluoride (FL). That’s the glass that will give you the clearest most vivid image at the highest magnifications and lowest light levels. This is a scope with the highest qualities of manufacture and glass inside. So much so that you can zoom in all the way to 60x and still get clear in focus images. That’s where you need to be to spot anything detailed at up to 500 yards. Kowa aren’t an American brand as you’d imagine from the name. They’re part of a corporation that produces a large amount of products for a lot of industries. Their optics however are renowned for quality and outdoor enthusiasts love the quality. The TSN 880 is the flagship of their optic range and contains the best quality of crystal lens containing fluorite that help to reduce chromatic aberrations that you see when viewing at distance to an absolute minimum. When you’re searching a target for a bullet hole at up to 500 yards distance, aberrations will cause the edge of those holes and any scoring rings to lose focus and appear blurry or squared off. This quality of glass is going to help stop any of that affecting your view. The eyepieces for this scope are interchangeable and it is compatible with 25x long eye relief eyepieces, and 25-60x zoom eyepieces depending on your scenario. This scope as you’d expect for one of this quality is fully waterproof and fogproof. Here’s the manufacturers video for this scope that showcases the flexibility and versatility of the Kowa system. If you really want to be sure what’s happened at up to 1 mile away from your target in any weather condition and in any light conditions, even the dark, you need some sort of camera. That’s where the AmmoCam comes in. It’s a remote rechargeable camera that doesn’t need paid wifi or cellular access to transmit data so there’s no monthly bill. It creates it’s own wi-fi network. You do however need a line of sight from the transmitter at the target to the receiver at your end which can be your tablet, phone, ipad or laptop. The target manager software runs on the receiver and shows you the image of the target. The remote transmitter (the camera pack) has a rechargeable battery that the manufacturers claim will run the camera for 12 hours before you need to recharge. This unit has night vision and whilst theres a cheaper ‘sight-in’ edition that works to 300 yards if you really want long range you need to go for the ‘long range’ model that works out to the full mile.